OMG Leanne! I want to grab one right off my screen! So wish I had one right now with my morning coffee! Delicious work! Thanks Mary Ann! They are pretty darn delicious for breakfast with coffee! 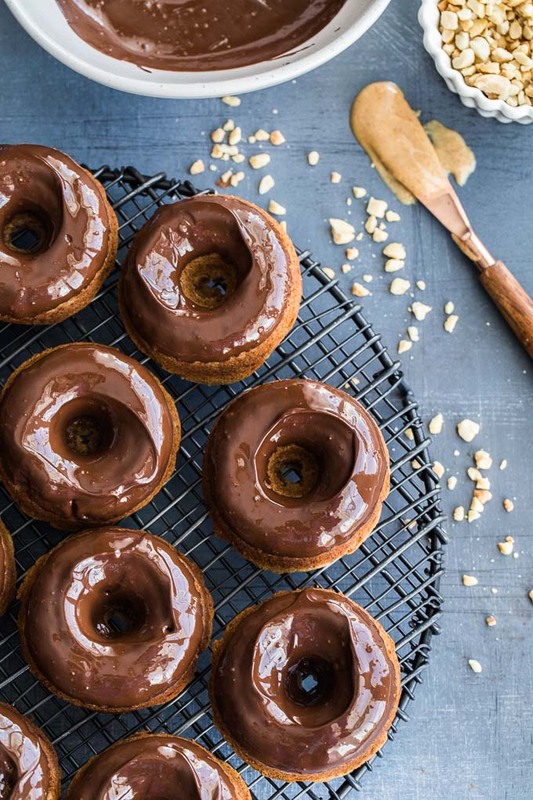 I never wanted a donut pan, until now! Wow what gorgeous looking donuts! I love that you added protein to this treat! Thanks Terri! I’m so glad I picked up a donut pan a while back. I use it all the time! I prefer making baked doughnuts at home over fried just because of the reduced mess! The addition of protein into the mix is an even better bonus. Especially since peanut butter is involved. Thanks Erin! I’ve never made deep fried donuts, but I can imagine the mess. And yes, the peanut butter is the best part! Oh yum!! These look super! I love the glaze and peanuts on top. Thanks Amy! These are delicious on their own, but I definitely enjoy mine with the glaze and chopped peanuts! Chocolate + pb is one of my all time flavour combos so these are totally calling my name! Wish I had one of these about 4 hours ago with my coffee. Then again, there’s always tomorrow 😉 Have a wonderful weekend ahead! Thanks Dawn! Chocolate and PB is definitely one of my fave combos too! And they are pretty awesome with morning coffee! Hope you have a wonderful weekend too! I’ve been meaning to buy a donut pan for a while….this is a sign that I MUST! YUM! Chocolate and peanut butter go together like PB+J for me. So much goodness! Love that these are healthier as well so you won’t go for a sugar crash after you eat them! Great recipe, Leanne! I use my donut pan all the time, almost as much as I use my muffin pan. And I feel the same way. Chocolate and PB go together like PB&J! I love both combos equally. Thanks Haylie! Happy weekend! I LOVE baked doughnuts! So light and delicious! This flavor combination is the bomb! Truly!! Chocolate and PB are a match made in heaven! Pinned! Thanks Annie! Baked donuts make such a great snack. And the mini pan I use makes the right sized donuts for snacking! And I 100% agree that chocolate and PB are a heavenly match! I’m all in for these donuts! Two flavors that I love together – Chocolate and PB! Thanks Lisa! I love those flavours too! 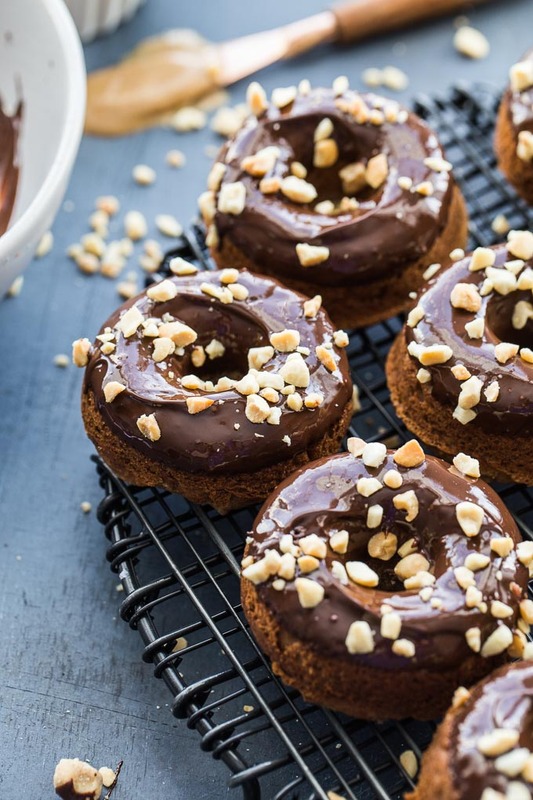 You always have the best donut recipes! The only thing better than the recipe are the pictures! Thanks so much Terry! You’re always so kind with your comments! I wish I could eat one of these right now! That glaze looks amazing. Such a winning flavour combo!! I’ve never heard of protein donuts! These look fabulous. The shiny glaze is amazing. Thank you Karen! Gotta love the shine from melted chocolate! Wow! These look incredible. If they look half as good as they look (which I am sure they are) then they are for sure a winner! Thank you so much Kallee! Pb and Chocolate it a can’t be beat combo and Banana is always a good addition to the party. Right?! Thanks Patrick. They’re a great trio! Protein donuts are such a great way to start the day. 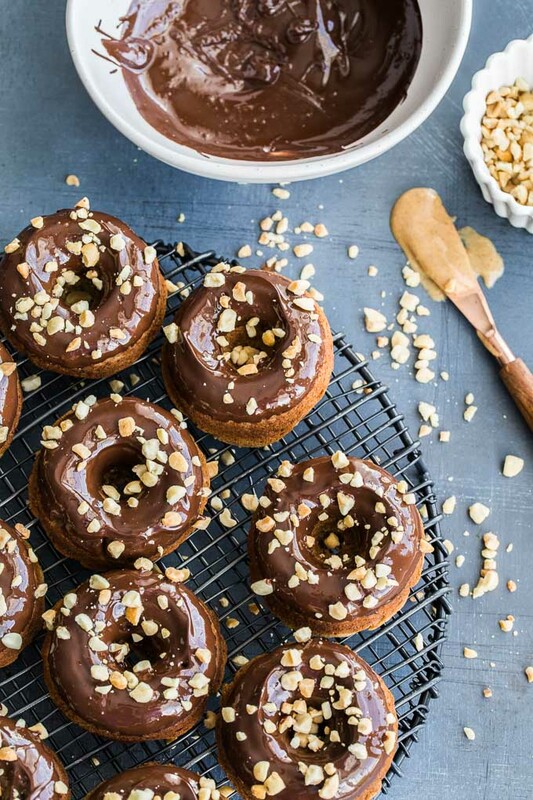 That chocolate glaze makes the donut! These are awesome! I’ve been trying to find versions of my favorite treats with the protein content amped up. Thanks Jolene! I hope you get a chance to try them! Oooohh these might be my favorite donuts you’ve made. They look so good, Leanne! Peanut butter and banana were made for each other! Have a great weekend! Thanks Kelsie! 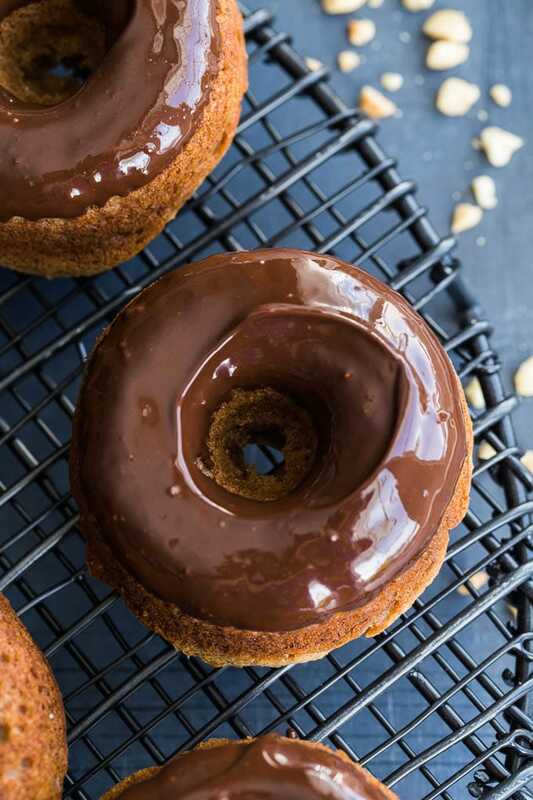 I don’t want to dis my other donut recipes, because I really love them, but these might be my favourite too! Happy weekend! I’m not usually a banana fan, but these donuts are convincing me to give them another try! Thanks Jaida! My husband isn’t a fan of banana either, but he really liked these donuts. The banana taste is very subtle. I love that you use buckwheat in these…definitely an ingredient that doesn’t get used often enough! Thanks Colleen! I’ve been trying to cut back on grains, so I use buckwheat flour and buckwheat flakes all the time lately. And buckwheat flour pairs wonderfully with almond flour. These little donuts look scrumptious! I would have never thought they were secretly healthy! Thanks Valentina. I like to balance a little decadence with wholesome ingredients! Thanks Tanya! 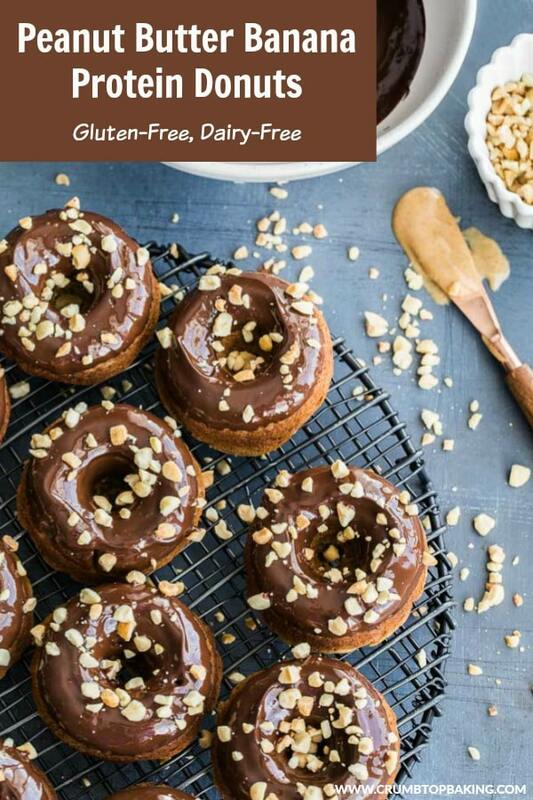 I tagged these donuts as a healthy dessert, but a lot of people are wishing they had one to enjoy with their morning coffee or tea. I’m beginning to think I should have categorized these as breakfast!! Wow Leanne! I need this glaze in my life. totally pinned this and bookmarked it in my heart. This is my favorite recipe from you so far!!! Aww! Thanks Camila. That made my day! And I think you would really like the glaze! I’m trying to figure out ways to add it to all my desserts! Haha! 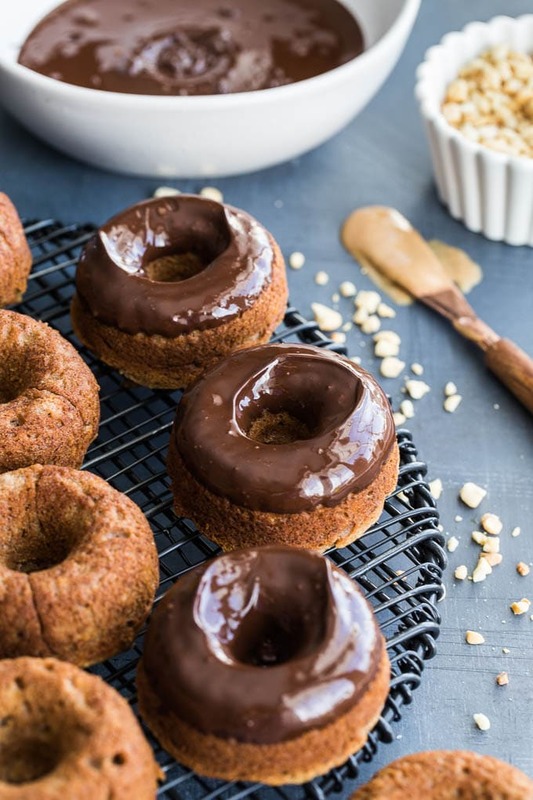 These peanut butter banana protein donuts look perfectly scrumptious! 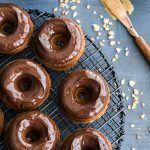 I love the extra texture with the chopped peanuts on top of that gorgeous chocolate glaze! Thanks Amy! I like the little crunch the peanuts add too! 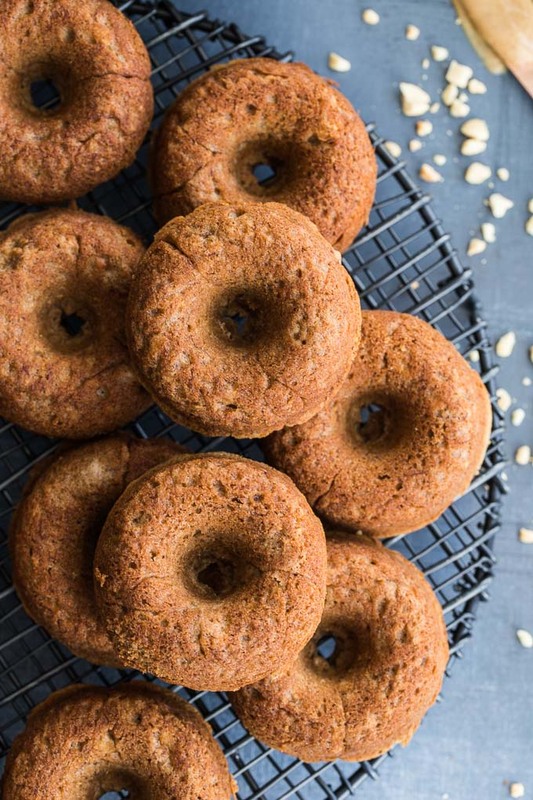 I have a donut pan I need to try this healthier version asap! Well, now it’s looks like I’m going to have to invest in a donut pan! Best flavour combo EVER! Thanks Elaine! PB and banana is definitely a great combo. And you should totally invest in a donut pan. I use mine all the time! Any time you can eat donuts for breakfast and not feel guilty is a good day. I think these fit the bill. Thanks for sharing! Thanks! Donuts for breakfast! I like the way you think! Banana and peanut butter! And made with buckwheat and almond flour which I love. Adorable and delicious! Thanks Nicoletta! 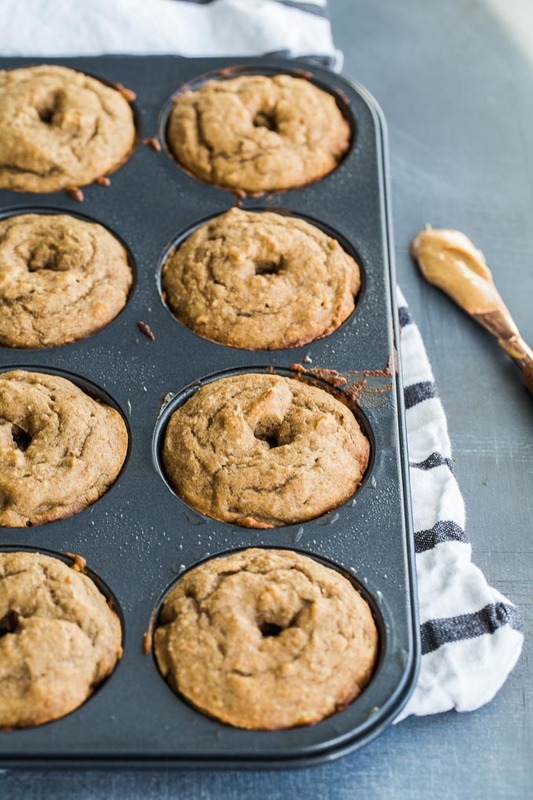 Buckwheat and almond flour are great….especially together! Happy almost weekend! Haha! Totally Dana! Plus, how can you go wrong with chocolate and PB?! Hope you get a chance to make them! I am ready to make these donuts! we are a fan of peanut butter and banana. Instead of chocolate can I spread some strawberry jam on top? yum! Thanks Marilyn! Spreading strawberry jam on top sounds like a delicious idea! Let me know how it goes if you try that! Leanne, I didn’t think it was possible to make donuts healthy-ish, but you’ve done it. Everything about this post is fantastic. I absolutely love your photography on this one too! Thanks so much Yvonne! That is so lovely of you to say! I’m glad you like the post! I totally agree with all your reasons for loving these donuts – they sound fantastic! 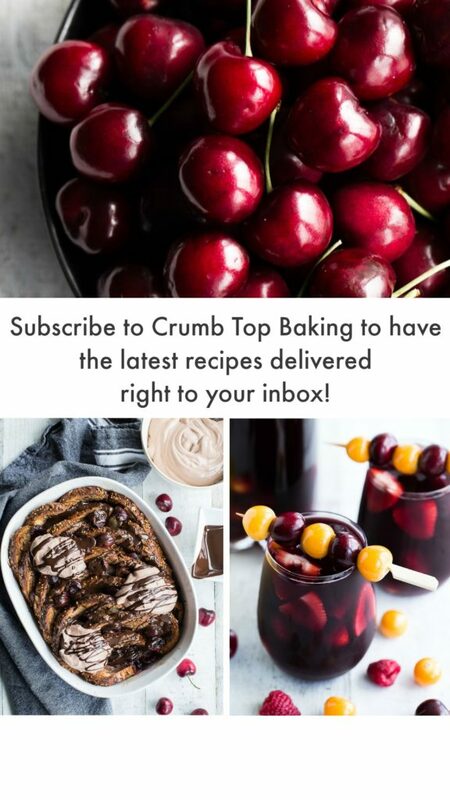 The idea that they are baked and healthy too has me wanting to make them NOW! Thanks Terri! I’m glad they appeal to you! Hope you’re having a great week! Leanne you’ve done it again – my mouth is watering. I can’t wait to make these. They will fit in perfectly to my weekly meal plans. Thanks Kristen! That’s so nice of you to say! If you make them, let me know!